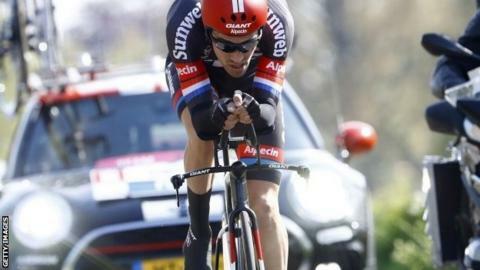 Tom Dumoulin won the opening 9.8km time trial of the 99th Giro d'Italia by just one-hundredth of a second. The three-week race is beginning with three stages in the Netherlands, and the Dutch rider delighted home fans by winning in 11 minutes three seconds. He beat Primoz Roglic of Slovenia on the flat, technical route in Apeldoorn to claim the race leader's pink jersey. "It is a relief. I'm feeling sick in my stomach now but at the same time so happy," said the Giant-Alpecin rider. "A hundredth of a second is a breath of air. It wasn't my best time trial but I'm wearing this jersey now. "I will defend this as long as possible. I don't think I have the level to compete in the real big mountains." Italy's Vincenzo Nibali, who rides for Astana, won this race in 2013 and is among the favourites to repeat that feat when the race concludes in Turin on 29 May. He was 16th on stage one, 19 seconds adrift of Dumoulin. Another tipped to ride well is Movistar rider Alejandro Valverde, who won the 2009 Vuelta a Espana in his homeland. The 36-year-old is competing in his first Giro and is 23rd, 24 seconds off the pace. There are no British riders in the race but British-based Team Sky's Spanish leader Mikel Landa finished 40 seconds adrift. The race was not on the schedule of Britain's Chris Froome, who is focusing on winning a third Tour de France title in July. Saturday's second stage is a largely flat 190km sprint stage from Arnhem to Nijmegen.